Our unique Vegas-style casino is fun and edgy, with a wide variety of games and amazing casino bonuses. Craps being one of them, craps has some of the best odds in the casino, so there’s a lot of winning to be done. This is a game in which everybody (except the house) can win together, and when everybody’s winning, a craps table can get pretty wild. Listening to the chatter, a novice player may have no idea what it’s all about. A fast-talking stickman goes hand in hand with the rapid game of craps. 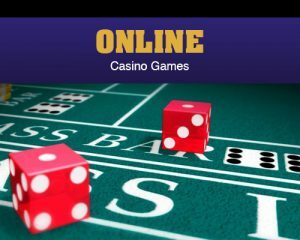 As similar to a live casino as it looks, in our online casino you have less things to worry about. Learning to play craps is quite simple and in our opinion is easier than learning some other casino games that require correct strategy such as blackjack. The trick to getting started is to learn a couple of the basic bets and how the game progresses. Once you have the basics mastered you can have a look at the other betting options and decide if you want to make additional bets. The great news is that the two most common bets have some of the lowest house edges in the casino. All crap games follow a set order of play. Each round starts with the come out roll and continues until a seven is rolled. If you have never played before you might want to watch a game or two before you start. A simplified order of play is as follows. When you are new to craps you should focus on just two bets. The Pass Line Bet and the Odds Bet. You place the Pass Line bet by placing a chip on the Pass Line section of the table. If the shooter rolls a 7 or 11 you win even money. If the shooter rolls a 2, 3 or 12 you lose. The Odds Bet great choice as it has no house edge! To make an odds bet you must first place a Pass Line bet on the come out roll. If a point is established you then place another bet below your Pass Line Bet. The amount you can bet is determined by the casino but most offer double odds which means you can bet double your Pass Line Bet. The Odds Bet wins if the pint is rolled before a 7. The amount you win depends on the point. Typical pay outs are as follows. If the point is 4 or 10 you win 2 to 1. If the point is 5 or 9 you win 3 to 2 and if the point is 6 or 8 you win 6 to 5.